FILE: President Edgar Lungu going through the program with the Director of Ceremonies Bishop Brigadier General Vincent Mwenye while looking on is Minister Ronald Chitotela. President Edgar Lungu has said that he will only fire Housing and Infrastructure Development Minister, Ronald Chitotela if the court finds him guilty of corruption. President Lungu said that Mr. Chitotela was innocent and that the prosecutors should be given chance to prove whether the corruption allegations placed on him are indeed true. The Head of State said that no one should be allowed to interfere in the process and that he will give leeway to the Anti-Corruption Commission (ACC) to take Mr. Chitotela to court. President Lungu was speaking to journalists at the Kenneth Kaunda International Airport shortly before departure for Livingstone for a night stop in transit to Sesheke to drum up support for PF Candidate Dean Masule. The President also called on political players and Zambians to desist from politicizing the fight against corruption. President Lungu that he was saddened that the arrest of Mr. Chitotela by the ACC is being politicised by certain individuals, adding that he does not instruct the police to investigate anyone because it is their mandate to do so. Meanwhile, President Edgar Lungu has called on Patriotic Front (PF) members to embrace new members if the party is to continue growing. The Head of State said the PF was weak in some areas due to the trend by ‘old members’ shunning and bullying new members on the basis of them being in the party for a longer period. “PF is for all of us but I have heard that our members in Livingstone and other parts of Southern Province are selfish as they do not want to grow the party” Mr. Lungu said. Mr Lungu clarified that even those who joined the party at the eleventh hour were bona fide PF members and would help keep the PF alive and growing. He also warned that if founding members did not want to embrace the new ones, then the party leadership would work with the ‘late comers’ for the benefit of the party. “Those who join us at 11 o’ clock shall have lunch with us at 12 o’ clock because that is the leadership of Michael Chilufya Sata,” he said. Mr Lungu said this upon arrival at Harry Mwaanga Nkumbula International Airport in Livingstone on Thursday. He was accompanied by PF Secretary General Davis Mwila and Justice Minister Given Lubinda and was welcomed by Works and Supply Minister Mutotwe Kafwaya, Southern Province Minister Edify Hamukale, senior government and party officials. Mr Lungu further said PF as a party was premised on power to the people, adding that anyone who thought he could have power without the people’s support was wasting their time. “People lead because there are those willing to follow and one should reflect on why people follow them. There is no magic about leadership. Leadership is about listening and giving people what they want and that is what we shall continue doing as a party,” he said. Earlier, Southern Province Minister Edify Hamukale directed the Livingstone City Council to allow residents who applied for land two years ago to be allowed to pay for it in six equal instalments. Dr Hamukale said most residents had limited resources and could only be empowered with land if allowed to pay in instalments. 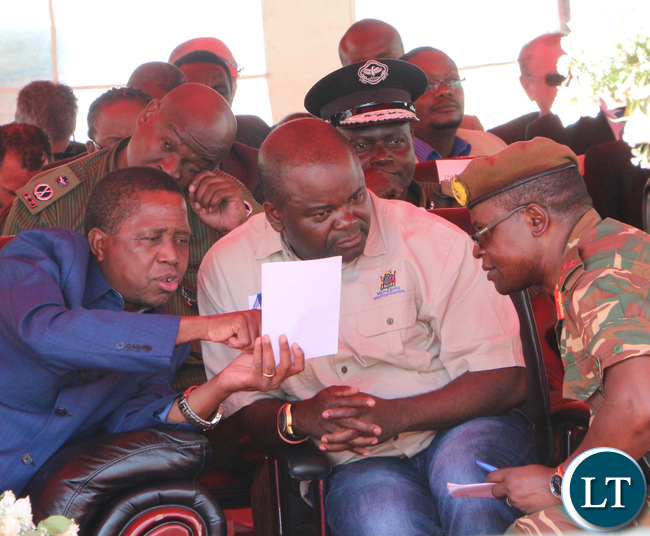 He commended President Lungu for authorising him to make the directive following an outcry from Livingstone residents. And the Provincial Minister appealed to President Lungu to consider giving Livingstone a preferential tax regime to maximize revenue generation and prevent losing out on trade deals to other countries. Dr Hamukale said this could be used as a pilot project to enable government assess revenue generation levels before scaling up to other areas. He also attributed the province’s good pass rate in the 2018 examinations to good infrastructure such as boarding schools which provided favourable studying environment to pupils; and the increase in the number of teachers deployed to the province. Mr Lungu is enroute to Sesheke, Western Province on a campaign trail to drum up support for PF Parliamentary candidate Dean Masule in the upcoming Sesheke by-election. President Lungu is not being sincere. Which Court found E. Kabanshi guilty for him to fire her? This is the CHIPANTE PATE people talk about. Use the same principles for all. Finally, their is no court in the world that can find Chitotela guilty for the charges levelled against him. But he has brought his cabinet and the party in desripute. That alone warrants a suspension – and a guilty verdict would then warrant a dismissal. I think the president should wash his hands here if he can. Kambwili should be reinstated then. All animals should be equal. Somethings people do or say under influence of alcohol kushikwata fye amano. Mushota has spoken sense for the first time. The practice all over the world is to suspend someone who has been implicated in a wrong doing so that he does not interfere in the investigation and the suspension is lifted if he is found to be innocent. As an engineer, a layman, I find it odd to challenge the President who is alleged to have obtained a distinction in law at UNZA on a fact of law. With this comment from Lungu, Chitotela is safe. Lungu has just indirectly told his judges not to convict Chitotela. Watch this space !! President Lungu is hypocrity why didn’t he wait for Kabanshi and Kambwili to be proved guilty before firing them? The man has no shame even to defend such things. Anyway when dizzy and scared of own shadow it does happen. Well, that concludes that chapter. Clearly Chitotela wouldn’t go down alone. He would take several others with him, including very close associates of Mr. Lungu and perhaps Mr. Lungu himself. Otherwise we wouldn’t see such double standards being applied. But anyway 2021 is not far. Everyone, including Mushota, are saying the right things here. When I tell foooools here that I detest Lazy Lungu because he is corrupt…this clearly not about corruption with Lazy as he is a tool for corruption….rewind to 2013 how Old man Sata handled this swiftly. You need to specify whom you call foooools or apologize. I thought they cleaned up foooools like @Sharon & @Katondo Boys MHSRIP. Three quarters of bloggers in Zambia,only gets 10% of truths. 90% is not and will NOT BE known to them. So who really knows the crime which Mr.chitotela committed? and how much truth do you get Mr. P illock ? These are questions you need to ask Lazy a former lawyer….this is the reason why he can never host a press conference..imagine how Lazy would respond to that!! But if the president does not want to fire Chitotela then we should get rid of the president. He should be impeached, i wonder if he even commands the support of his MP’s at the rate he is going.What is happening with the impeachment motion? So why did you fire others, you are just a comedian. Neither is running government for CONVICTED EMBEZZLERS or active participant of institutionalized corruption. Stage managed, come 2021, you will answer how you accumulated worth!! No matter what, we will clean up from house to house. Everyone must show where they got the money to build. It will be Armageddon!!! He has to go on leave so that he does not interfere. I think he moves with junta in his jacket. Honestly how can he say such a thing. This arrestor is just another comedy. He needs to be suspended while investigations are ongoing. The Permanent secretary can easily perform the minister’s duties. That is what they are there for. President Lungu, heed our request. I tell if the investigators and this Lungu were serious with what they were doing without cover ups, even the PS you are mentioning cant be spared!! But why is mr Lungu commenting on this? The boss should be annoyed when his workers are stealing. Not ifi!!! Why is Zambia so unfortunate that citizens are led by a bunch of shameless thieves? @toi toi, Zambia is not unfortunate. It is the voters’ fault. Most of us stayed away from voting due to apathy. PF grouped up…. Next election, make sure to cast your vote, it counts. You think Chitotela is stupid enough to say he’s guilty upon plea? I guess it’s fair those ministry of education accountants who were found to have stolen public funds to be reinstated because they haven’t yet been found guilty, maybe Kambwili and Kabanshi should be reinstated as Ministers since they are guilty of nothing. The president’s logic is massively flawed here, or maybe he’s equally compromised, since several others are linked to this. If ACC can’t guarantee Chitotela being found guilty then this is a SHAM and ACC should be disbanded. We can’t be paying people to sip coffee and only fart in offices, we may as well be shredding tax payers money. Why then was Hon. Emerine Kabanshi dropped even before it was established and has never been established she was guilty? serious, then our president is on his way out of office because no one is on your side advising you. the very intelligence system is working to hound you out of the presidency,that is how it works no doubt about it. He acted because of donors outcry and the stopping of aid. She was a sacrificial lamp. This guy is empty headed. A lawyer should even know better than anyone else that keeping a person in office who is facing criminal investigations is not right. What a terrible mistake we made as Zambians! a president,a minister , a permanent secretary or a director has no pleasure to do wrongs against the citizens. Mr President, in all my life, I have been advised that once I realize the mistake I have made, I should correct it immediately, you have clearly realized that it was wrong of you to fire Kambwili based on allegations, so as a caring Zambian I would advise you to give him back his position, but that is a take it or leave it kind of advice but it is up to you to think over it. Of course there is a possibility that he will refuse the re appointment but you would have done your side of the bargain which you could table before any one as an example of who you are. The Presido here is contradicting himself. How can he side with Chitotela while at the same time he wants the investigative wings to conduct an investigation? Following his statement am sure the investigative wings are already dead scared to proceed with investigations and guys consider this case closed..its done and dusted! Chitotela is now a free man and thanks to the Presido’s uncoordinated statement and stating his position. Now its more corruption in PF and this status quo to withstand until 2021. Zambia need a Mwanawasa type to fight these vices and not pretenders bane. Good day! Sounds like an April fool’s day joke. What a Leader! Most Americans are still regretting having elected a president with no political experience. Here in Zambia, Zambians are wondering the kind of vision and principles the man they elected as president has. To this president if murder convict Keith was in his cabinet he would have kept him as minister until convicted. Mr. President separate law from morality. You need to build a solid base of morals and principles to guide your actions. I think the concept of a laughing stock is now entrenched. From 34-year old donations to a suspect serving while under investigation. Ni katwishi cabe manje. but boss musabaila. Was Kambwili found guilty? Kambwili was taken out because of his ambitions. It was to clear the way for 2021. THE TIME THE COURTS OF LAW FINDS HIM GUILTY HE WOULD AUTOMATICALLY CEASE TO BE A MINISTER,SO THEN? ?HOW DO YOU FIRE AN EX MINISTER??? I HAVE SAID IT BEFORE THAT THIS MAN MR LUNGU IS NOT SERIOUS AT ALL. HOW CAN A SERIOUS PRESIDENT CONTRADICT HIMSELF LIKE THIS. I HAVE CLEARLY BELIEVED THAT THE DISMISSAL OF KAMBWILI WAS NOT ALL ABOUT CORRUPTION ALLEGATIONS BUT FOR HIS OWN SAFETY LUNGU FEARING THAT IF HE KEEPS CK IN PF,KAMBWILI WILL CHALLENGE HIM AND LOOSE ANY ELECTIONS. HE FIRED KAMBWILI WITH NO EVIDENCE AND TODAY HE IS SAYING HE CAN’T FIRE CHITOTELA ON MERE ALLEGATIONS. LIKE SOME HAVE SAID,SAY SORRY TO CK AND REINSTATE HIM. where the hell is TIZ? They are all in the same deals together- just know there is nothing Chitotela can do without the consent of Lungu. The statement made by bakateka ine ukupapa. Its like he regrets firing Kambwili…. how can he really say ati I dont want to loose Chitotela the way I lost Kambwili really….. I miss Mwanawasa. Mtembo Nchito and Kabanshi were suspended by Lungu because in his opinion they could have interfered with investigations if they carried on in their job .What is so special with this chitotela whose history is tinged with corruption . This is the most useless President in the world .Mark my words ,this is a side show to diverge Zambians attention from Esther Lungu’s wasteful spending in America . Lungu does not have the will or capacity to fight corruption . Just by that statement by the President that Chitotela is innocent until proven guilty by the courts of Law in its natural meaning implies that no one can arrest Chitotela. The President is the final authority. It has already instilled fears in the governance systems of the country. I’m sure the Director at ACC is fearing for his job. Even when the case is taken to the courts of law, Chitotela will not be found with a case to answer. It’s a closed case in other words. I know Chitotela, he must have threatened President Lungu. Those charges are flimsy and do not hold water. What does this mean. Its the PF playing with our minds and the donors. They know its just a sewelo to fool us that they are working. Why – the tone of the PF leader says it all and we are dwiiiii!!!! Utter nonsense!!!! This man will one day run away from Zambia – lets wait and see!!!!! Chitotela can still go for good. People power should show of who is boss. Onganised peaceful demonstrations and picketing in all the big cities and provincial headquarters. Anyone who doubted lungu’s incapacity to lead can now see what an empty tin we have in the presidency. Birds of the same Feathers Cloak together. Lungu’s is allergic to people high morality, ethics and integrity.